This April will mark the 28th anniversary of my first published article after high school. Less than a year after graduating from Clark High School, my exclusive interview with then-UNLV point guard Mark Wade was splashed across the front page of the Las Vegas Sentinel-Voice, the state’s only African-American newspaper. That was 1987. Little did I know the next time we’d do another exclusive 1-on-1 interview, it would be under somber circumstances. 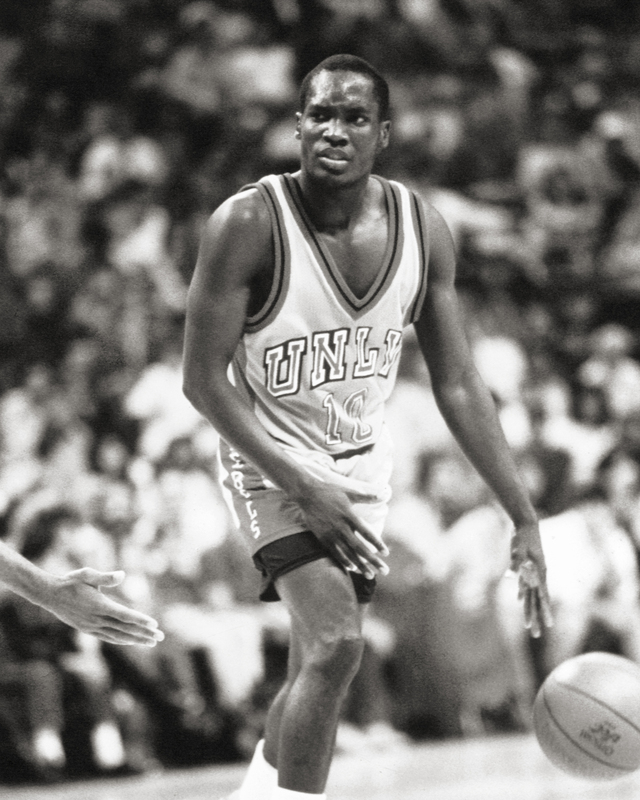 Just as he was UNLV’s loyal floor general who helped lead the Runnin’ Rebels into the 1987 Final Four, and was an extension of the coaching staff on the court, he was loyal to his former coach on Wednesday, roughly three hours after we were all saddened by the news that Jerry Tarkanian had joined his friend and former North Carolina coach Dean Smith in the afterlife. Mark, understandably shaken, spoke about a number of things with me, talking about how much Tarkanian meant to not only him, but the program, university and city of Las Vegas. Much of what he said, I knew. The broad strokes, of course I knew. I’ve been here since 1972, and used to watch the Runnin’ Rebels play inside the Las Vegas Convention Center’s famed Rotunda, which resembled a spaceship. From Sweet Lew Brown, Eddie Owens, Sudden Sam Smith, Robert Smith, Reggie Theus and that high-flying bunch from the 70s, to Wade’s crew that included Armen Gilliam, Freddie Banks, Eldridge Hudson and Gary Graham, I had seen them all. 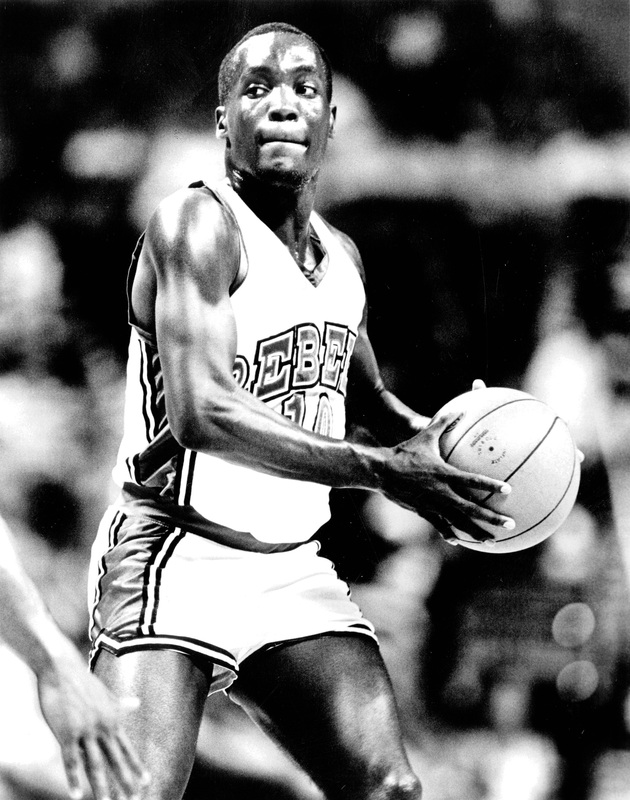 Yep, long before the 1990 National Championship – with Larry Johnson, Stacey Augmon, Greg Anthony, Anderson Hunt and George Ackles – we were all bleeding Rebel Red. Which is why his phone began blowing up shortly after the 84-year-old legend died at Valley Hospital, just minutes from his home. 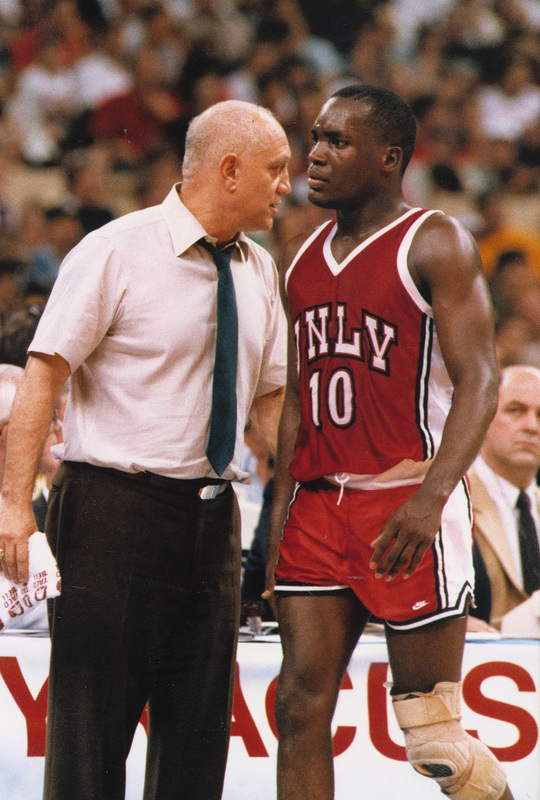 So many people knew what Tarkanian meant to Mark, who might have been diminutive in size, but who had as big a heart as any other Runnin’ Rebel in the history of the program. Which is why, to this day, he defends UNLV to the core. And boy did the Runnin’ Rebels execute it. They finished 37-2, averaged 92.5 points per game, allowed 75.5 points per contest and lost in the National Semifinal, 97-93, to eventual champion Indiana. But it was the game before that, against Iowa in the West Regional Final that Mark wanted to talk about. It’s the one game he remembers absolutely everything about, and the one game he believes epitomized the life and soul of Tark the Shark. Just like Tarkanian. In real life. “The Iowa game epitomized what Coach Tark was all about; it epitomized what college basketball was all about,” he said. Wade remembers one intangible being the culprit allowing Iowa to open a 16-point halftime lead on the Runnin’ Rebels. That culprit, in a sense, was Tarkanian, who had Gilliam throwing the ball in each time Iowa scored. “Our best finisher was taking the ball out of bounds, and that wasn’t working,” Wade said. “So at halftime, rather than him telling us what we were doing wrong, a couple players went to coach and we told him to switch Jarvis Basnight with Gilliam, putting the team’s best scorer into frontcourt, rather than the backcourt. UNLV outscored the Hawkeyes 42-23 in the second half and advanced to its second-ever Final Four. It was that kind of relationship that taught Wade to trust a coach, taught Tarkanian a lot more about the point guard on his team and displayed the type of coach who wasn’t afraid to learn from his players while teaching them how to win. 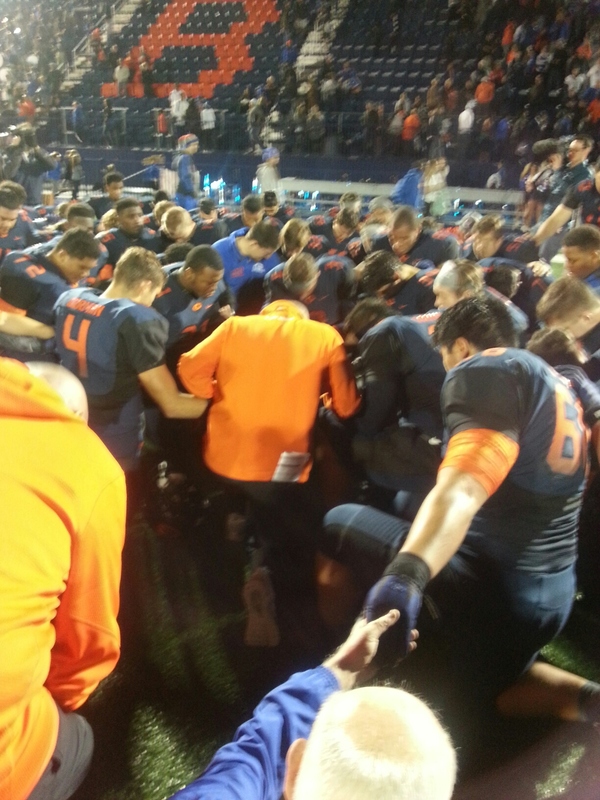 Bishop Gorman coach Tony Sanchez stands among his players after every game and sings the school song to the fans. “Now that we’ve won, we have the pleasure and the honor to practice this beautiful game of football on Thanksgiving morning,” Bishop Gorman coach Tony Sanchez told his Gaels after dispatching Arbor View in last week’s Sunset Regional championship game. So while you were preparing for your day filled with football, family and food – who doesn’t do that on Thanksgiving – Sanchez was where he feels most comfortable: Fertitta Field with his Gaels, getting ready for Saturday’s state semifinal against Sunrise Region champ Liberty. “I got what I think is one of the greatest jobs in the world. I do what I love, I coach high school football, I’ve got an unbelievable staff, I work at the greatest school in the world with the greatest faculty and staff and administration and look where my office is, look where my classroom is – I’ve got the nicest classroom in the city,” Sanchez said, during a 1-on-1 interview last week, prior to his Gaels’ win over Arbor View. It’s been a long ascension for Sanchez, resurrecting Bishop Gorman’s football program, which to some degree receives its fair share of criticism. A portion of the hate spewed toward the Gaels’ national powerhouse is from rivals, usually after they’ve been stomped into submission. But more of it is simply regurgitated comments from people who don’t know any better, and simply repeat what they hear. But what many people don’t know is the man who was brought to Las Vegas from California, and who has led the Gaels to five straight state championships behind discipline, work ethic, values and good ol’ fashioned blue-collar football labor. Sanchez took over in March of 2009, after building California High School into a dominant state program over a previous five-year span. Heeding the advice of a friend about a vacancy at Gorman, he took a shot and threw his name in the ring. At the time, there was no Cadillac-like stadium. The Gaels were practicing on a small patch of grass behind where Fertitta Stadium now sits. There was no first-class weight room, as there might have been 10 racks to train on. There might have been just more than 100 kids in the entire program. It was a different culture, according to Sanchez, and most importantly – the first thing he pointed out – the Gaels were picked to lose to Palo Verde. After all, the Panthers won the year prior in blowout fashion. Now, Fertitta Stadium has all the bells and whistles a high school football stadium could ask for, the 41,324-square-foot Fertitta Athletic Training Center includes a four-lane, 60-yard track, a 90-seat classroom and an athletic training room with a hydrotherapy pool and ice bath. There are now more than 170 kids in the program, and oh yeah, the Gaels are ranked No. 1 in the country. “Gorman had a lot of talented kids so I knew there was gonna be a lot of heavy lifting involved in regards to creating a disciplined culture, getting kids to do the things the right way, buying into a year-round program, sacrificing a lot more time in the summer – just creating a sense of discipline,” Sanchez said. And by doing his job of instilling the right mindset with his program, the parents and boosters followed suit. Let’s be frank, Bishop Gorman does have some wealthy alumni, and the campus didn’t move from Maryland Parkway because the private entity wasn’t receiving donations and because tuitions weren’t increasing. But they also weren’t just going to throw money around without the right guy in place, to build a nationally ranked program. It didn’t take long once Sanchez took over, as the Gaels went a perfect 15-0 on their way to the state title, with a 62-21 victory over Del Sol. The Gaels tallied 798 points in 2009 and led the nation in points scored. Some might say the competition Gorman faced wasn’t near as good as the teams in California, Texas or Florida, but they may be the same people who say their glass is half empty. Those with a glass half full, saw Gorman finish No. 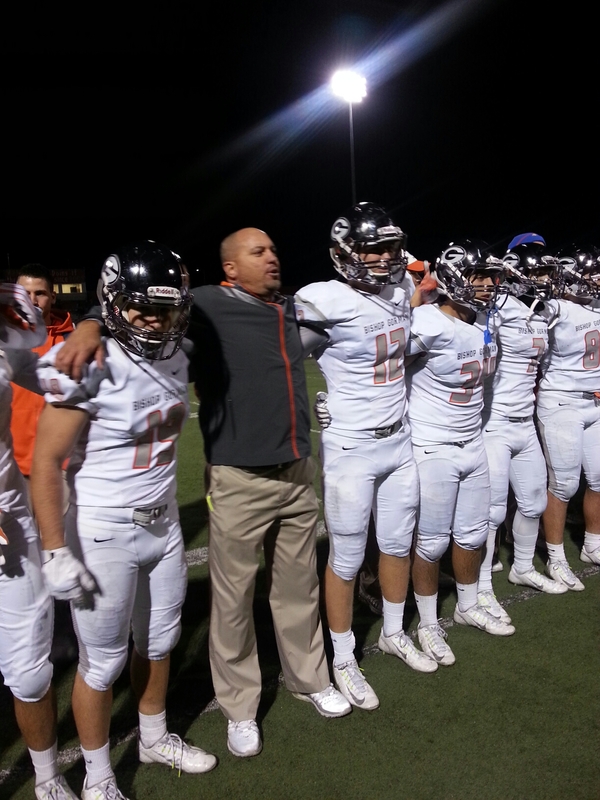 25 in the nation, according to Prep Nation, and Sanchez being named a Max Preps National Coach of the Year finalist. 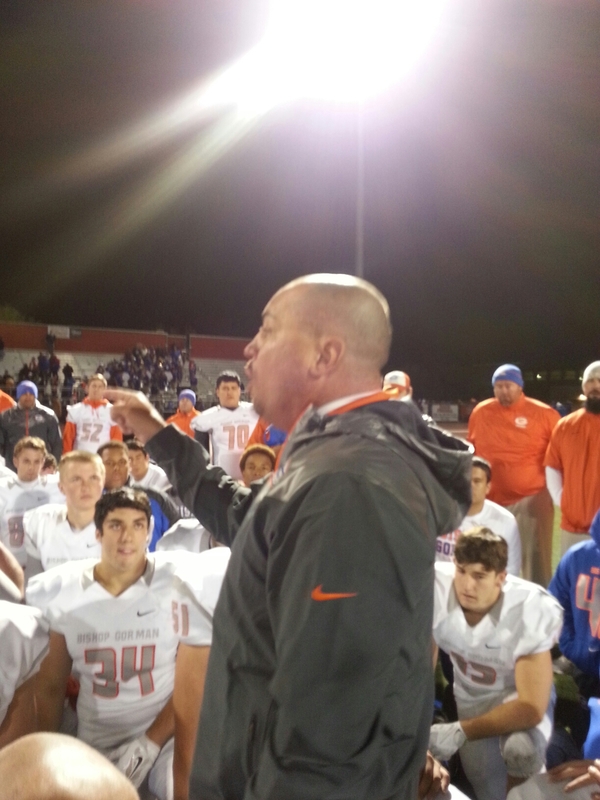 Bishop Gorman coach Tony Sanchez has led the Gaels to five straight state championships. Nothing has changed the past four seasons, either, as the Gaels have reeled off state titles each year, slowly climbing in the national polls and creeping their way into living rooms on national TV, including numerous appearances on ESPN. In 2010 the Gaels outscored opponents by a combined score of 692-101. In 2011 the Gaels took on three nationally ranked teams – beating then-No. 10 Chaparral (Ariz.) 42-22, knocking off then-No. 13 Servite (Calif.) 31-28, and suffering its only loss to the nation’s then second-ranked Armwood (Fla.) 20-17. They finished the season ranked fifth nationally by USA Today. 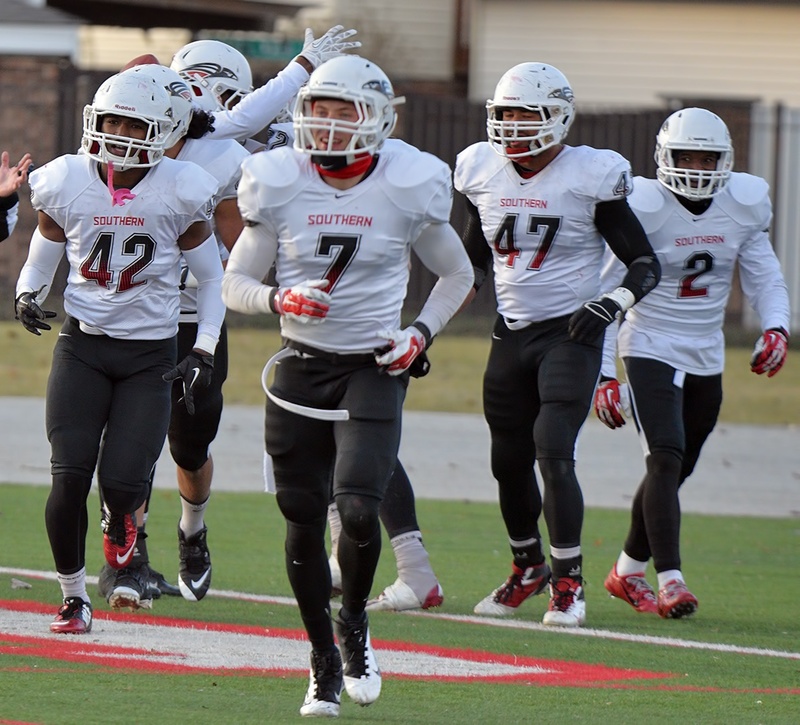 While averaging 55.5 points per game in 2012, they finished the season ranked ninth in the nation by USAT. Last year, in traveling as far as New Jersey and hosting the No. 1 team in the nation, the Gaels seemingly benched their mark thanks to arguably the toughest non-conference schedule in the nation. 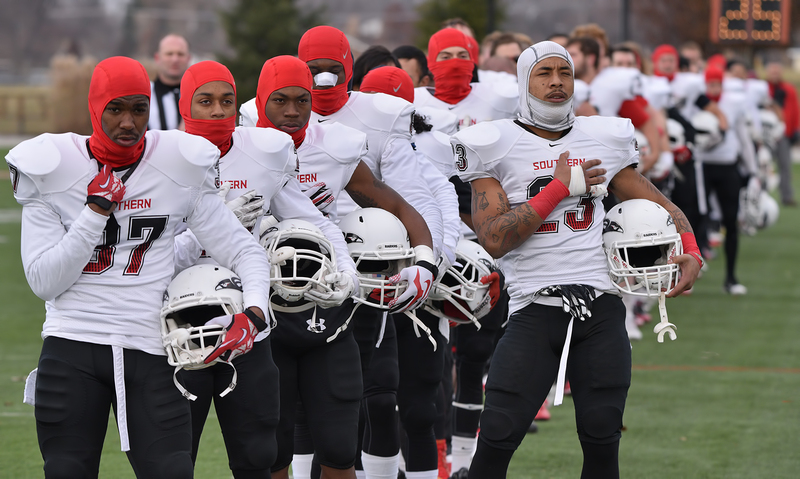 They finished 17th in the nation, but the foundation was laid for this year’s run to No. 1. Sanchez said he’s exceeded his expectations from original goals, and isn’t done with what he’s started. With success comes adversity. Sanchez, his coaches and the Gaels don’t necessarily face much of that in terms of local competition. I mean, they haven’t lost to a local school since Sanchez got here. For his coaches, their adversity is living up to his expectations and fulfilling the model he brought to Las Vegas by executing it with each coach’s unit. For the players, it’s taking that model, perfecting it and then putting it on the field. For Sanchez, well, he’s at the top. So his adversity is to make sure the vehicle continues to run smooth. Gaels coach Tony Sanchez talks about his love for reading books written by some of the greatest football coaches ever. Gauging from the bookcase in his office, he’s been mentored by some of the greatest coaches in the history of the sport. Books by Lou Holtz, Jimmy Johnson and Bear Bryant – to name a few – or quotes and anecdotes he shared with me, the ones that resonated and stuck with him. Sanchez is deeper than some might think, or see when he’s firing up and down the sidelines, screaming at someone. It doesn’t matter the score, Sanchez is a fiery guy. He summarized that to me in a post-game interview after beating Centennial two weeks ago, saying he is a perfectionist. And if something goes wrong on the field, and you see him going off on a player or assistant coach, he’s probably not half as mad at them as he is himself. He’s the type of guy who takes things personal. And if a cog in the engine of his vehicle breaks down, he’s taking the blame. He may be yelling at the car he’s driving, but he knows it’s up to him to give it a tune up. Sanchez said the Gaels’ 17 consecutive days off during the summer is the longest break they get. They start hitting weights their first day back in January, after Winter break, and continue for eight months leading into the season. He’s quick to point out that many of the programs in the valley do the same thing, and he’s not taking anything away from the Libertys, Palo Verdes, Arbor Views, so on and so forth. 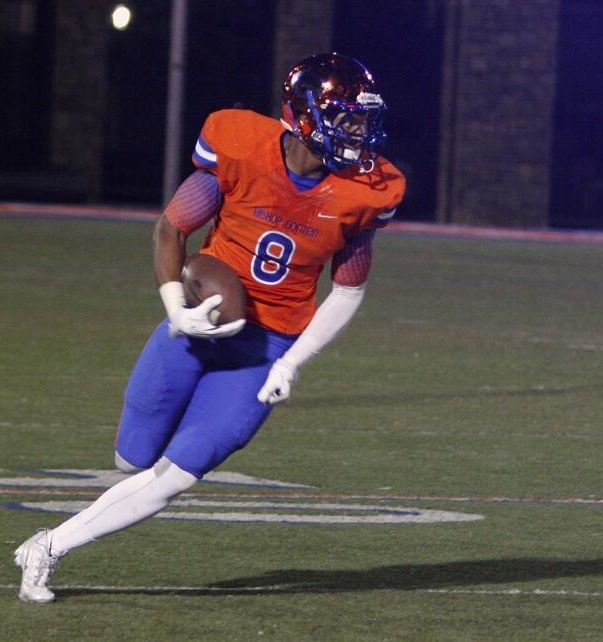 But make no bones about it, Bishop Gorman does not boast a program chock full of talent that show up, put their pads on and dominate by accident. There’s work involved in sculpting the nation’s No. 1 program. Notice the word “WE.” Again, Sanchez takes everything personal, and is a guy who knows it starts at the top. It’s his responsibility to make sure the Gaels are firing on all pistons and remained a well-oiled machine. Which is probably why they were practicing this morning, while many of you were trying to figure out the difference between sweet potato pie and pumpkin pie. Away from the field, away from the game of football, Sanchez is a loving husband and doting father who is like any of us away from their job. He tries not to bring his job home, and is appreciative and thankful for his wife, who shelved her career with a major pharmaceutical company so he could fulfill his dream of building Gorman into a national power. His kids are his life. You can see it when he speaks of them. You can see a twinkle in his eyes when he speaks about Bishop Gorman football, but you can see the apples in his eyes when he speaks about his children. Sanchez said he isn’t worried about the criticism and rumors that swirl around the Gaels’ athletic program, and can’t be concerned what he, his family, his coaches or his family hears, because he’s too busy thinking positive every time he wakes up. “I don’t think about it at all,” he said. “There are so many people that think we’re doing a great job. There are so many people who show up in the stands and who are cheering our kids on. We’ve got parents out there feeding our kids (after practice). I’ve got kids busting their tail to try to create opportunity later in life, just to keep this program going, to compete at a high level. I’ve got no time and energy for anything that’s not positive. We’re about moving forward, we’re about focusing on the things we can control. And what can we control: our attitude and our effort every single day. In the end, Sanchez said he’s taken each coaching position with the same mentality based off a quote he was given by friend and coach Tony Samuel, and lived by that mantra ever since. After singing to the fans, and a post-game speech from Sanchez, the Gaels end each game is ended with a prayer. And from what I can tell, he’s not blowing smoke. I gave Sanchez a chance to fire back at his critics. Offered up a forum to discuss the public’s accusations. But not a negative word to say. He credits his coaches and his players, saying they’re the reason the Gaels are successful. He loves his job, he loves his staff and he loves the game of football. He loves Bishop Gorman High School. Perhaps, maybe, as tough as the No. 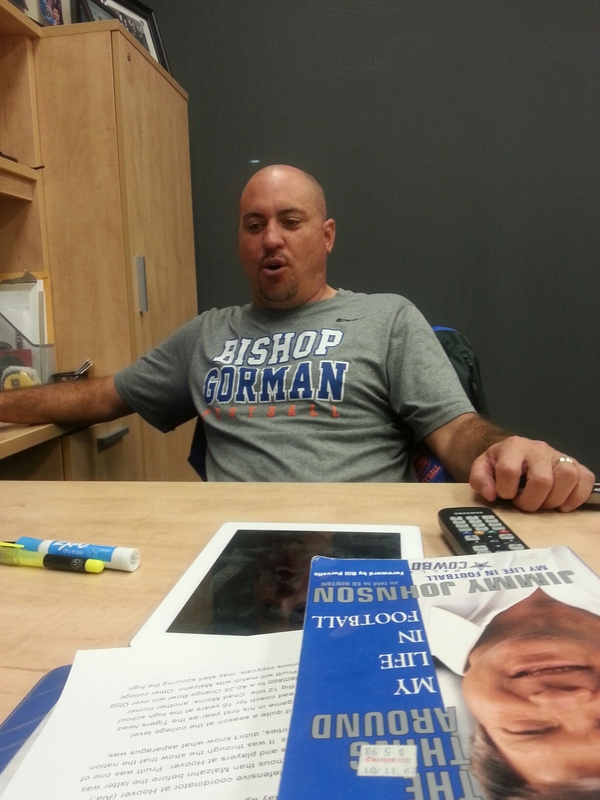 1 ranked Bishop Gorman Gaels, and the man driving the vehicle – coach Tony Sanchez.